Rheumatoid Arthritis in the TMJ is curable. 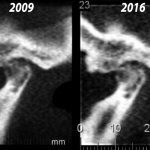 CONE BEAM CT SCANS on a patient treated in December 2009 show a remarkable improvement in the quality of the bones of the TMJ complex. Occlusal correction along with systemic medications for RA and osteoporosis improved the quality of bone that often deteriorates with time. In seven years, the patient had no more TMJ pain and no further bony deterioration. Some areas showed actual improvement of bone quality. Lighter areas indicate the return of bone mass, something very unusual.